My only memory of snowmobiling is being dragged behind one as a child, the wooden toboggan bumping over a frozen Saskatchewan lake as I struggled to hang on. It didn’t spark a love of snowmobiling but when I found myself in Quebec’s Lanaudière region – a popular winter destination for Europeans – I wanted to see what the fuss was all about. “Without snowmobiling this resort wouldn’t be open,” chuckled Bernard Hamel, Vice-President of Sales and Marketing, pointing at the sprawling 150-room Auberge du Lac Taureau nestled between towering trees, and in summer, surrounded by tea-coloured lakes and white-sand beaches. 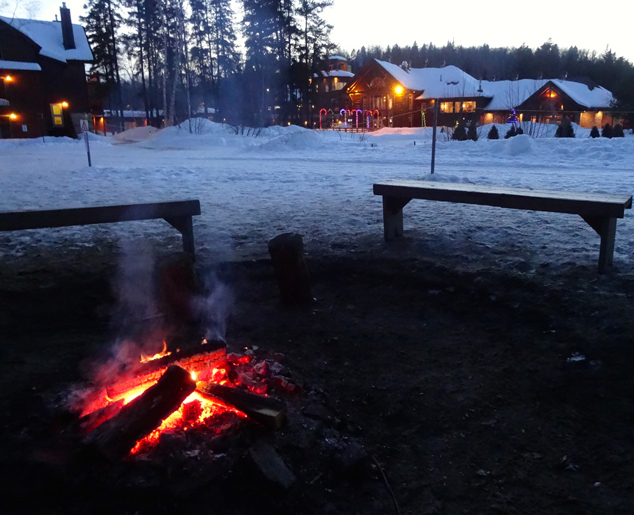 This log cabin resort is the only Canadian hotel to join the Relais Du Silence network. The Relais brand stands for quality & service; the silence endorsement means they offer more non-motorized than motorized sports. But since it’s the snowmobiling everyone is coming for, steps have been made to make the snowmobiles more environmentally friendly, choosing machines with lower pollution and noise outputs. I signed up for a beginner ride guided by Benoit Pelletier who is fluent in English and outdoor sports. He explains how to start the large Ski Doo, accelerate and stop. Then he kills any idea of racing wild over the frozen lake saying we will ride single file, and he will set a safe – read slow – speed. Satisfied his group of newbies was ready, Pelletier moved forward. I squeezed the throttle and lurched forward before easing back, only to almost stop. I struggled to set a steady speed as I followed Benoit’s tracks. At times the ruts bounced me off my intended course and I realized this isn’t as easy as driving a car. I leant into a curve and aimed the big machine at the center of the trail. There are 33,000 kilometers of snowmobile trails in Quebec – enough if laid end to end to circle 80% of the earth – but we covered only a few kilometers. Satisfied his flock of new snowmobilers was in control, Pelletier accelerated down a flat stretch. I poured on the gas and the speed climbed: I felt my adrenaline climbing until lights wiggling in the trees warned of approaching snowmobiles and Pelletier slowed down. All too soon it was time to turn back and swap positions with our passengers. I climbed onto the back seat as another snowmobile apprentice takes the controls. I settled back, admiring the deep carpet of snow I had been too busy to see minutes earlier. Venus rises in the evening sky as we return to our starting point. A fire crackles in the Auberge’s outdoor fire pit, offering a place to decompress after the afternoon excitement. I stop briefly, enjoying the sight of the lodge’s soft lights against the dark forest while steam from hot tubs drifts into the sky. Driving a snowmobile is more work – and more fun – than I thought. I head for the hot tub with a new appreciation for motorized winter sports. **Westjet has added more flights to Montreal with 19 flights each week between Montreal and Calgary. It is a 2.5-hour drive from Montreal to Auberge du Lac Taureau. For the love of snowmobiling – Click to Tweet. What’s all the fuss about snowmobiling? My friend, @Reinventure, is sharing her experience here: Click to Tweet. Is snowmobiling all it’s cracked up to be? Click to Tweet.